From the Department of Neurology (D.M.H. ), Ghent University Hospital; Department of Pediatrics (A.V.V., J.S., E.V., R.V.C. ), Division of Pediatric Neurology and Metabolism, Ghent University Hospital; Department of Radiology (M.A. ), Ghent University Hospital; Department of Nuclear Medicine (I.G. ), Ghent University Hospital; Center for Medical Genetics Ghent (T.S., B.M. ), Ghent University, Belgium; and Center for Medical Genetics (S.S.), UZ Brussel and Reproduction Genetics and Regenerative Medicine, Vrije Universiteit Brussel, Brussels, Belgium. Objective To report the clinical, radiologic, biochemical, and molecular characteristics in a 46-year-old participant with adult-onset Leigh syndrome (LS), followed by parkinsonism. 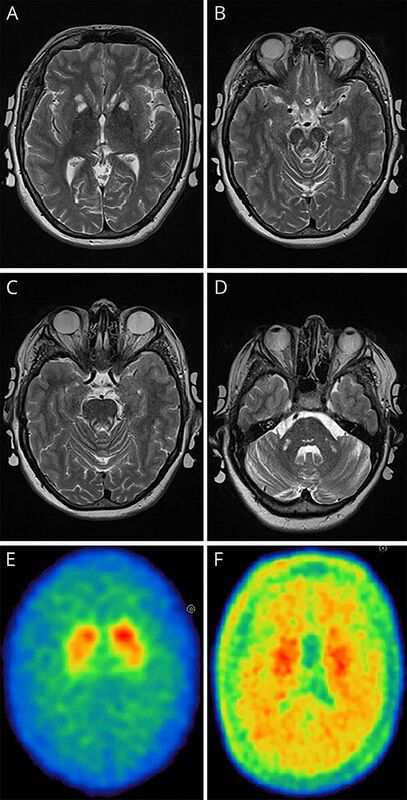 Methods Case description with diagnostic workup included blood and CSF analysis, skeletal muscle investigations, blue native polyacrylamide gel electrophoresis, whole exome sequencing targeting nuclear genes involved in mitochondrial transcription and translation, cerebral MRI, 123I-FP-CIT brain single-photon emission computed tomography (SPECT), and C-11 raclopride positron emission tomography (PET). Results The participant was found to have a defect in the oxidative phosphorylation caused by a c.626C>T mutation in the gene coding for mitochondrial methionyl-tRNA formyltransferase (MTFMT), which is a pathogenic mutation affecting intramitochondrial protein translation. The proband had a normal concentration of lactate in blood and no abnormal microscopic findings in skeletal muscle. Cerebral MRI showed bilateral lesions in the striatum, mesencephalon, pons, and medial thalamus. Lactate concentration in CSF was increased. FP-CIT SPECT and C-11 raclopride PET demonstrated a defect in the dopaminergic system. Conclusions We report on a case with adult-onset LS related to a MTFMT mutation. Two years after the onset of symptoms of LS, the proband developed a parkinson-like disease. The c.626C>T mutation is the most common pathogenic mutation found in 22 patients reported earlier in the literature with a defect in MTFMT. The age of the previously reported cases varied between 14 months and 24 years. Our report expands the phenotypical spectrum of MTFMT-related neurologic disease and provides clinical evidence for involvement of MTFMT in extrapyramidal syndromes. Leigh syndrome (LS) is a devastating neurometabolic disorder occurring mainly in infants and young children. Affected children initially develop normally but present between the age of 2 and 9 months with signs of motor regression, weakness, hypotonia, weak cry, and failure to thrive. Shortly thereafter, signs of brainstem dysfunction are seen, including respiratory pattern abnormalities, nystagmus, ptosis, and ophthalmoparesis. Other neurologic manifestations include pyramidal tract signs, ataxia, dystonia, tremor, and seizures, eventually progressing to death, usually within 2 years after onset of symptoms. Pathologic hallmarks of the disease are bilaterally symmetrical foci characterized by spongiform necrosis with capillary proliferation in the midbrain and striatum.1,2 The incidence is 1 in 40,000.3 Rarely, the onset of symptoms is in late childhood, adolescence, or adulthood. In this study, we describe a patient with adult-onset LS caused by a homozygous pathogenic mutation in MTFMT. Our observation broadens the clinical spectrum of MTFMT-related disease. Case description with a diagnostic workup included results from blood and CSF analysis, skeletal muscle investigations, blue native polyacrylamide gel electrophoresis (BN-PAGE), whole exome sequencing (WES) targeting nuclear genes involved in mitochondrial transcription and translation, brain MRI (bMRI), 123I-FP-CIT brain single-photon emission computed tomography (SPECT), and C-11 raclopride positron emission tomography (PET). Written informed consent for research was obtained from the participant and her guardian. Anonymized data will be shared by request from any qualified investigator. A 44-year-old woman was admitted to the department of neurology after 1 week of dizziness, vomiting, somnolence, and subfebrility (37.8°C). Before admission, she had complained of double vision. Divergent eye motility was observed intermittently. Her medical history revealed mild cognitive impairment, early-onset bilateral sensorineural hearing loss, autism spectrum disorder, obsessive-compulsive behavior, depression, osteoporosis, obesity, and mild chronic obstructive pulmonary disease. Vitamin B12 hypovitaminosis was diagnosed in the past as the cause of pernicious anemia. Neurologic examination on admission to the hospital was limited because of poor cooperation and somnolence. Slight nuchal rigidity, gait ataxia, hyperreflexia, plantar reflexes in extension, and absence of sensorimotor dysfunction were noticed. Neuroophthalmologic examination showed upward gaze palsy, downward gaze paresis, bilateral miosis not reacting to light and preserved convergence, and ability to abduct the eyes. Coordination could not be tested because of insufficient cooperation. Urinary retention was detected on arrival. In the 3 weeks after admission, a deterioration of gait and balance was seen, as well as lack of initiative. Slight speech difficulties (hypophonia and tachylalia) were detected, as well as slow movements. Differential diagnosis included Wernicke encephalopathy, acute demyelinating disease, and LS. Acute stroke was excluded with acute brain CT. IV vitamin B-complex, including thiamin, was started but did not change symptoms within the first days. Later on, her clinical condition stabilized. Gait, balance, and speech recovered slowly over a period of 1 month, although a high-pitched tachylalia remained present and appeared to be already known before admission. Gradual improvement of diplopia and bladder dysfunction was seen, although the sensorineural hearing loss was worsening. bMRI showed nonacute lacunar or cystic T2-hyperintense lesions in the basal ganglia (caudate nucleus and putamen) and remarkable acute symmetrical fluid attenuated inversion recovery (FLAIR)-/T2-hyperintense lesions in the mesencephalon, suggestive of Leigh disease (figure, A and B). Follow-up bMRI 1 month later showed that brainstem lesions were more pronounced in the mesencephalon and pons, extending into the medial thalamus bilaterally. bMRI 3 months after symptom onset showed tissue loss and gliosis, with reduced FLAIR hyperintense signals in the mesencephalic area, in both thalami and new lesions in the middle cerebellar peduncles (figure, C and D). CSF analysis on the first admission was normal, except for increased lactate concentration (38 mg/dL, normal 10–22), confirmed a few days later (33 mg/dL). Serum lactate, vitamin B12, and thiamin were normal. Ophthalmologic examination showed abnormal eye motility but no signs of optic atrophy or of retinitis pigmentosa. Ultrasound examination of the heart revealed mild left ventricular hypertrophy (interventricular septum and left ventricular posterior wall thickness of 13 mm). The urinary bladder was atonic. The clinical presentation and technical and biochemical investigations were suggestive of a mitochondrial disease compatible with LS. A skeletal muscle biopsy (M. quadriceps femoris) and skin biopsy were performed. Histologic analysis of skeletal muscle showed no abnormalities. Ragged red fibers were not detected. Spectrophotometric measurement of the OXPHOS complex activities revealed a combined deficiency of complexes I and IV. In cultured skin fibroblasts, a significantly decreased activity of complex IV was found (complex I not assessed) (table). BN-PAGE, followed by in-gel activity staining using isolated mitochondria from cultured skin fibroblasts, confirmed decreased activity of complexes I and IV, and in addition, showed the presence of complex V subcomplexes. These findings together are the hallmark of defective intramitochondrial protein synthesis. Sequencing of the complete mitochondrial genome with massive parallel sequencing methodology in leukocytes and skeletal muscle did not reveal a pathogenic alteration. DNA sequencing of the POLG gene was normal, and comparative genomic hybridization microarray analysis showed no abnormalities. Molecular workup by WES targeting nuclear genes revealed a homozygous missense mutation (c.626C>T, p.Ser209Leu) in MTFMT (NM 139242.3). Biotin-thiamin responsive basal ganglia disease caused by a mutation in SLC19A3 was excluded. Parents were not available for testing. Brain MRI on admission showing T2 nonacute neostriatal cystic lesions (A), hyperintense lesions in mesencephalon and pons (B and C), and subacute lesions in middle cerebellar peduncles (D). I-123 FP-CIT SPECT (E) and C-11 raclopride PET (F) showing bilateral reduced presynaptic dopamine transport and bilateral postsynaptic dopaminergic impairment. SPECT = single-photon emission computed tomography. Two years after the onset of symptoms of LS, at the age of 46 years, extrapyramidal symptoms (EPS) were seen characterized by marked hypomimia, mild bradykinesia, difficulties with fine motor skills, discrete cogwheel rigidity, diminished arm swing amplitude, disturbed finger movements, slight dysdiadochokinesis, and hypophonia. Tremor was not observed. Gait and balance were near normal. The effect of EPS on daily activities was limited, and, therefore, medical treatment was not started. EPS remained stable over the course of 5 years after the onset. Thereafter, a mild positional tremor of both hands (left > right) was noticed and bradykinesia worsened. Brain I-123 FP-CIT SPECT scan showed bilateral symmetrical reduced FP-CIT binding in the basal ganglia (figure, E). Brain C-11 raclopride PET revealed severe bilateral neostriatal reduction of C-11 raclopride (figure, F). A therapeutic trial with levodopa was started with limited beneficial effect on tremor and bradykinesia. LS is usually reported as infantile subacute necrotizing encephalomyelopathy, a neurodegenerative disorder clinically characterized by variable neurologic signs. Bilateral lesions in the striatum are typically seen on brain imaging studies. The onset of symptoms in infancy or early childhood is usually triggered by metabolic or infectious stress, followed by rapid neurologic deterioration, often leading to death.7 Long-term survival after early-onset LS and atypical late-onset variants has been reported.8 The number of patients with late-childhood–, adolescent-, or adult-onset LS is limited, and only in a few, the genetic defect was identified. The MTFMT gene product is essential for efficient mitochondrial translation initiation and function. The protein is involved in formylation of a portion of the Met-tRNAMet pool to generate formylmethionyl-tRNA needed for initiation of protein synthesis in mitochondria.4,9 We report here the oldest patient so far with a homozygous pathogenic mutation in MTFMT who developed adult-onset LS. Limited evidence on dopamine transport imaging in LS is available. A study on 123I-FP-CIT striatal binding in 14 patients (age 35–69 years, median 48 years) with mitochondrial disorders and complex I deficiency failed to demonstrate dopaminergic cell loss. However, none of these patients suffered from LS or showed clear signs of parkinsonism.20 In the participant reported here, cystic lesions in the neostriatum reflecting basal ganglia degeneration caused by mitochondrial dysfunction are likely to be involved in EPS. Of interest, a recent study on the etiologic role of epigenetic influences in PD showed a role of several microRNAs involved in a network of genes associated with PD. It was shown that the expression of MTFMT (influenced by miR-488) was downregulated in the cingulate gyrus of patients with PD as compared to healthy controls. Dysregulation of 1 or more of the genes in the PD-genetic network, including MTFMT, might interfere with extrapyramidal neuronal integrity and function.21 The findings in the participant described here provide additional clinical evidence for the hypothesis that MTFMT is involved in PD-related genetic network and that MTFMT dysregulation might be an etiologic factor in parkinsonism. We cannot rule out that the older age of the proband as compared to other reported patients may have played a role in the development of atypical parkinsonism. At present, it is unclear whether parkinsonism is part of the MTFMT phenotype. Natural history data on patients with MTFMT mutations and advanced age are lacking. Our data suggest that dopaminergic neurons in patients with LS caused by pathogenic MTFMT mutations may be more susceptible to PD because of the impaired OXPHOS system, ultimately leading to a clinically significant extrapyramidal syndrome. Adult-onset LS can be seen in patients with c.626C>T mutation in MTFMT. We showed that the affected patient had a defect in the dopaminergic system associated with atypical parkinsonism. Further research on the natural history of patients with pathogenic MTFMT mutations is needed to clarify the full clinical spectrum and underlying physiopathologic mechanisms. Each author listed in the manuscript has participated in editing the manuscript, has seen and approved the submission of this version of the manuscript, and takes full responsibility for the manuscript. In addition, A. V. Vanlander, T. Sante, E. Vantroys, and B. Menten conducted, analyzed, and interpreted the whole exome sequencing experiments; D. M. Hemelsoet and A. V. Vanlander acquired and analyzed phenotypic data; J. Smet acquired and processed all patient samples and analyzed data. A. V. Vanlander, S. Seneca, and B. Menten performed and interpreted Sanger sequencing. J. Smet and T. Sante contributed to study design and data analysis. M. Acou and I. Goethals were responsible for analysis of MR, PET, and SPECT imaging data and provided images for figure. D. M. Hemelsoet and R. Van Coster were responsible for primary study oversight and design, data acquisition, data analysis and interpretation, and primary writing of the manuscript. D. M. Hemelsoet and R. Van Coster are responsible for the overall content of the manuscript. A. V. Vanlander was supported by the Ghent University (Ugent, BOF, grant number 01DI2714) and the Steunfonds Marguerite-Marie Delacroix. E. Vantroys was supported by the Ghent University (Ugent, BOF, grant number 24J.2014.0005.02). D. M. Hemelsoet has served on the scientific advisory boards of Pfizer and Boehringer-Ingelheim and has received commercial research support from Sanofi-Genzyme and Shire. A. V. Vanlander and J. Smet report no disclosures. E. Vantroys has received governmental research support from Ghent University. M. Acou, I. Goethals, T. Sante, S. Seneca, B. Menten, and R. Van Coster report no disclosures. Full disclosure form information provided by the authors is available with the full text of this article at Neurology.org/NG. The authors thank the patient and her caregivers for their willingness to participate in this study. Accepted in final form October 15, 2018.
. Subacute necrotizing encephalomyelopathy in an infant. J Neurol Neurosurg Psychiatry 1951;14:216–221.
. Leigh syndrome: clinical features and biochemical and DNA abnormalities. Ann Neurol 1996;39:343–351.
. The genetics of Leigh syndrome and its implications for clinical practice and risk management. Appl Clin Genet 2014;7:221–234.
. Mutations in MTFMT underlie a human disorder of formylation causing impaired mitochondrial translation. Cell Metab 2011;14:428–434.
. Clinical and functional characterization of the combined respiratory chain defect in two sisters due to autosomal recessive mutations in MTFMT. Mitochondrion 2013;13:743–748.
. Phenotypic spectrum of eleven patients and five novel MTFMT mutations identified by exome sequencing and candidate gene screening. Mol Genet Metab 2014;111:342–352.
. A guide to diagnosis and treatment of Leigh syndrome. J Neurol Neurosurg Psychiatry 2014;85:257–265.
. Long survival in Leigh syndrome: new cases and review of literature. Neuropediatrics 2014;45:346–353.
. An N-terminal formyl methionine on COX 1 is required for the assembly of cytochrome c oxidase. Hum Mol Genet 2015;24:4103–4113.
. Methionyl-tNA formyltransferase (MTFMT) deficiency mimicking acquired demyelinating disease. J Child Neurol 2016;31:215–219.
. New perspective in diagnostics of mitochondrial disorders: two years' experience with whole-exome sequencing at an national paediatric centre. J Transl Med 2016;14:174.
. Challenges managing end-stage renal disease and kidney transplantation in a child with MTFMT mutation and moyamoya disease. Pediatr Transplant 2016;20:1000–1003.
. Identification and functional characterization of a novel MTFMT mutation associated with selective vulnerability of the visual pathway and a mild neurological phenotype. Neurogenetics 2017;18:97103.
. Late onset Leigh syndrome mimicking central nervous system vasculitis. Mol Genet Metab Rep 2014;1:280–282.
. Biochemical characterization of pathogenic mutations in human mitochondrial methionyl-tRNA formultransferase. J Biol Chem 2014;289:32729–32741.
. Leigh and Leigh-like syndrome in children and adults. Pediatr Neurol 2008;39:223–235.
. Leigh's syndrome in an adult. J Neurol 1984;231:253–257.
. Juvenile parkinsonism, hypogonadism and Leigh-like MRI changes in a patient with m.4296G>A mutation in mitochondrial DNA. Mitochondrion 2013;13:83–86.
. The dopamine D2 receptor ligand 18F-desmethoxyfallypride: an appropriate fluorinated PET tracer for the differential diagnosis of parkinsonism. Eur J Nucl Med Mol Imaging 2004;31:1128–1135.
. Dopamine transporter SPECT in patients with mitochondrial disorders. J Neurol Neurosurg Psychiatry 2005;76:118–120.
. Parkinson's disease: SNCA-, PARK2-, and LRRK2- targeting microRNAs elevated in cingulated gyrus. Parkinsonism Relat Disord 2016;33:115–121.